Do you want as many features as possible in a massage chair but your budget is limited? The Kahuna Massage Chair LM6800 Recliner with Heating Therapy just might be what you’re looking for. The Kahuna Massage Chair LM6800 is an excellent buy for the budget shopper. It includes L-track rollers (a continuous roller track from your head to your hamstrings), an innovative yoga program, plus a wide variety of features found collectively only in competing models nearly twice its price. Its main drawback is the lack of insulation on the foot rollers making for a rough experience. This can be easily remedied and we describe how below. The Kahuna range is manufactured by AJX.LLC. Founded in 1997, they are one of the leading suppliers of massage chairs to the US market. Their products regularly top best-seller lists and their customer service is highly rated. The LM6800 is made of a combination of plastic and steel with vinyl covering. The plastic segment looks a little cheap but is quite durable. The size of the chair comfortably fits individuals 5’0” to 6’4” tall. Its warranty period is 3 years. In comparison, its competitors offer warranties from 1 (cheaper models) to 5 years (such as the Authentic Beautyhealth Shiatsu massage chair). The Kahuna LM6800 is a great deal at its price, giving you a lot of bang for your buck when you go comparison shopping. The sheer number of options it contains are matched only by more expensive competitors. It implements the new L-track rollers that massage your back all the way past your rear end—a very noticeable difference from the S-track models that stop at your lower back. L-tracks provide about 35% more coverage than the traditional S-tracks, relieving even your tired thigh and glute muscles. Other contenders offering the same option, notably the Brookstone Renew, come in at twice the price. Another notable feature is that, despite the misleading product image of someone sitting upright in it, the LM6800 is a true zero gravity chair with two settings. The zero gravity feature allows you to recline weightlessly with your legs level with or higher than your heart. This is a position touted as being ideal for relieving stress on the body and allowing for a more concentrated massage sensation. 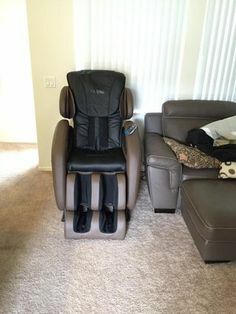 And while you’re in zero gravity position, note that this massage chair is structured in such a way that it only needs 5 inches of space between it and the wall for its zero gravity recline area unlike the more common 15 inches needed by other such massage chairs. Here’s a photo of the LM6800 in an actual home so you can get an idea of the space it occupies and how it would look in your living room. A small bonus is that the LM6800 actually has 6 automatic massage programs, not just 4 as noted on the merchant sites: Yoga, SV-Chiro, Deep Tissue, Stretching, Relax, Rejuvenate. The 30-minute Yoga massage program is a crowd favorite and quite enjoyable. It feels like you’re getting a massage while gently stretching your entire body at the same time. The stretching is quite discernible; for instance, you actually feel your back arching to limber it up. As we all know, despite quality control efforts, factory defects still occasionally slip through. If you do get a faulty chair, the merchant (Good Price World) has a track record for providing great after-sales support. Customers who contact them regarding serious issues receive quick replacements and their support staff are friendly and helpful. The LM6800’s massage experience itself, promised as a shiatsu massage, is good. 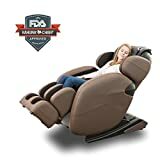 It won’t match the top end luxury massage chairs in the market, but it is actually equal to or better than many chairs at higher price points. The L-track roller massage and arm and hand airbag massage feel the same as the Osaki OS 3D’s, and better than the Human Touch Acutouch 6.0. The airbag shoulder massage feels much better than most competitors’. The main drawback to the Kahuna is that the foot rollers are extremely rough. The lining over the foot rollers is too thin to provide any actual protection for your feet. As a result, instead of a soothing foot massage, you get more of a painful jolting sensation. Fortunately, this is easily solved if you’re willing to do a little tweaking of your own. Just take some of the packing foam packaged with the chair when it was shipped, unzip the foot roller cover, and tuck the foam in to serve as a cushion for your feet. Presto! Your rocky massage has been toned down to a relaxing vibration. Roughness may also be a concern with the rollers for the legs and the back when you set it to Deep Massage depending on your sensitivity. The rollers may occasionally jar you at that level. If this affects you, this can also be easily solved with the stuffing-the-lining-with-foam trick. Another potential drawback is the volume of the massage chair. The LM6800 does make a fair bit of noise when running; this may or may not bother you. If you’re looking for a bargain, it’s still a lot cheaper to invest in this chair and a pair of earplugs than in the pricier L-track models. The package comes in at a hefty 220 lbs. and is unwieldy and needs two people to carry it to its destined spot in your home. Assembly can also be tricky despite there only being four parts to attach. This is due to the instruction manual having a couple of missing steps and being rather poorly translated to English. Further compounding the assembly issue is that some of the parts may not fit together perfectly, with a plastic slot or two being slightly too small for the screws. If this worries you, another option is to pay extra for the company’s White Glove delivery so you can leave delivery and assembly to the experts. Assembly takes roughly an hour. The Kahuna Massage Chair LM6800 isn’t the best massage chair on the market, so you’re out of luck if you’re looking for that. What makes the LM6800 remarkable is the value for money that you get for sheer number of features and the inclusion of L-track rollers. You’d be hard-pressed to find a better-priced deal anywhere.